paleo product reviews Archives - PaleoMunch! I love primal and paleo cookbooks. 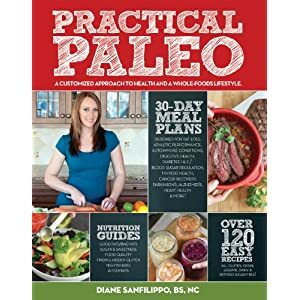 What caught my eye on this currently un-realesed cookbook was how in the title ‘Practical Paleo: A Customized Approach to Health and a Whole-Foods Lifestyle‘, the author, Diane Sanfilippo, speaks about customising. The term “customising” really resonates with me, as I like to make things work for me. There is little point in approaching something without a prospect of making that something individualised and customised to my specific tastes and requirements. In this case that would be specific needs within my diet and lifestyle. Remember that you can personalise your diet right down to what specific nutrients you are getting from the foods you are eating. Diane Sanfilippo is regarded as being one of the easiest to read voices in the paleo diet community, and is recommended by medical practitioners to their patients for aid to various nutrition-based health issues. Diane is known for being a clear and positive energy when communicating on and giving advice about the paleo diet and what it means to eat for the body. She appears to be completely focused on helping people achieve optimum health in their lives, and encourages people to perform at their maximum. She holds a Bachelor of Science from Syracuse University and is also a qualified nutrition consultant. She has particular knowledge in sugar level management and how certain foods affect the digestive processes in the body. Dian owns and runs her own blog, balancedbites.com and offers advice in podcasts which she publishes weekly. Overall, this looks to be a great addition to the paleo diet movement and I am certainly going to be buying myself a copy of her hardcopy when it becomes available to purchase. If you are interested in pre-ordering the book, click here!